Dubia Roach Growth and Population Density: Does Colony Size Matter? We recently read a few studies exploring the effects of roach colony population density on growth. One of them challenged a widely-held belief about Dubia roach housing and made us rethink the way we remove newly hatched nymphs from breeding colonies. Providing nymphs with their own enclosure makes intuitive sense. However, it may lead to sub-optimum growth. As you might imagine, we think about Dubia roach production quite a bit. But you don’t have to be us or an efficiency hound to care about it. Almost everyone who breeds or feeds Dubia roaches at some point ends up dealing with reproduction issues. Expanding roach populations usually require attention sooner than most people anticipate. With bugs that give birth to a few dozen young nymphs five times a year, production issues have a way of coming up whether you’re ready for them or not. While roach production issues commonly lead to hard, unsurpassable endpoints involving physical limitations and competition for scarce resources, one assumption has always been certain: Nymphs do best when given their own enclosure. Separating nymphs from adults is common practice among Dubia breeders. The idea is that removing nymphs from breeding colonies reduces resource competition and leads to happier, healthier, and importantly – more productive roaches. This seems like it should be a win all the way around. Adults get more room to do their thing and nymphs don’t have to fight roaches 50 times their size for food and space. But is this correct? Studies suggest it might not be…sort of. An interesting study from the US Army Solder Research, Development, and Engineering Center (of all places?) conducted by A. Wharton et. al. 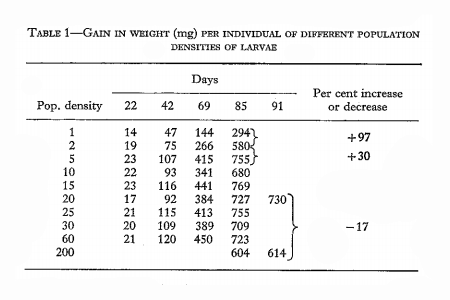 explores the relationship between cockroach colony population density and growth. Why the US Army investigated cockroach growth we have no clue, but here we are. Such are the mysteries of life. Investigators essentially look at two things in this study: (1) The size of roaches when they reach adulthood, and (2) how fast they get there. The independent variable acting on these two things is population density. Researchers wanted to see how density affects the growth of roaches from birth to adulthood, and what they found peaked our interest. Nymphs reared in isolation grow significantly slower than those surrounded by other nymphs. And to a point, the more crowded the faster the growth. This finding is consistent with other studies that look at roach growth and population density so it’s not all that unique or interesting. But…and this is a big “but”…the isolated, slower-growing roach nymphs ended up larger as adults than the roaches that grew faster in the presence of other nymphs their own age. The authors went out of their way to try to explain why this occurs. They tested a lot of different theories and eventually settle on a combination of physical contact and a hormone called ecdysone. They theorize that physical contact between roaches growing up together stimulates this growth hormone, which builds muscle and increases metabolism. As a result these roaches then eat more, which explains the faster growth. So we have two results: Slower growth and larger size in isolation, and faster growth and smaller size in non-isolation. Applying the ideas here to our own projects appears to be yet another simple and unsurpassable trade-off. In this case, the trade is size for speed. Slower growth results in bigger adults while fast growth leads to a smaller overall size. Fair enough. But then the researchers found a third thing, and it changes everything. Nymphs raised in the presence of adults grew fast like the nymphs raised in non-isolation, and they attained the same larger size as the nymphs raised in isolation. Based on this data, it appears there may actually be no trade-off at all. Maybe Dubia roach breeders can have the best of both worlds: fast growing nymphs and large adult feeders. But why? What is it about adult roaches that leads to faster growing nymphs that reach a larger adult size? The researchers aren’t sure about the mechanisms at play here so they go back to their theory about contact stimulation and hormones. It’s worth noting that upon observing the same results, authors of another study concluded that physical contact has a psychological benefit for roach endocrine development. We didn’t know roaches had a psychology. Guess you learn something new every day. Raising nymph-only colonies has always seemed unnatural in a way. Yes, they’re just roaches, but after noticing that large groups of young roach nymphs seem somewhat listless and less active than they were prior to being separated from their breeding colony, and after learning “roach psychology” is a thing, we decided to do a few tests. While the jury is out on the relevance of these data, there is little if any downside to checking it out. With that in mind, we began experimenting. We added a few adult females to the new juvenile colonies we create when we separate nymphs from breeders. We don’t know exactly what to expect, but the study finds about a 10% difference in the size of roaches raised in isolation versus those raised with other nymphs. All things equal, that means a 10% increase in adult size among the roaches reared with adults versus those reared only in proximity to other nymphs. Of course all things are never equal so we’ll have to see what happens. 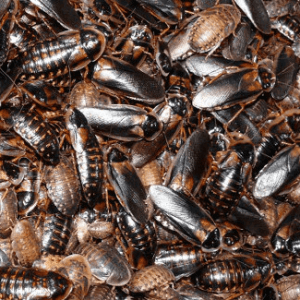 10% may not sound like a lot, but the more roaches you produce, the bigger the real effect. Then we considered the cost of this experiment, which is nearly zero. We will update this post with our findings as we learn more. It’ll take some time and the results will no doubt include confounding factors, but we’re curious to see what happens in time…or more accurately, if anything happens in time. About two months in and we aren’t seeing any size or growth differences between nymph-only and nymph w/adult enclosures. We’ll post more later. After much effort separating nymphs from adults and looking for growth differences, we finally have a result! More than a year later and we looked at this again and basically maintained our result. There’s no difference between nymphs raised alone and those raised with adult females. At least none that we could find. Sigh. Oh well. It’s possible that differences exist, but we weren’t able to see them. It’s also possible that the proximity of control and test colonies conferred benefits from one to another. The researchers hypothesized that the growth increase they observed is due to hormones. If so, hormones from one colony could affect another one close by. We simply don’t know. That’s the bottom line. So did we learn anything? Nothing useful, unfortunately. So, we continue to raise our nymphs in their own bins, without adults. If there is a hormonal benefit to living with adult females, our juveniles are close enough to adults to get it. Or, the benefit is too small to make a difference. Or, maybe what the researchers observed among juveniles and adults of another roach species is true, but it doesn’t apply to Dubia roaches. Whatever the case, we may never know. I love how nerdy you all are about roaches. Probably why I bought mine from you! I keep my nymphs together with the adults (to a certain point). I do have a separate bin of nymphs just the right size to feed my beardie, but the rest stay in the warm “breeder bin” and munch on orange slice slices and live out their days in style. All things being equal Maybe there is a point that the nymphs benefit more after a certain instar stage. Say take a control of 10 females that are gravid and place 5 in smaller containers. checking daily remove the females that give birth / gave birth within 24 hours of it, and place those females in the other container. then separate the babies so about half are with their parent and the others arent. Maybe try this a few times with different sizes, and ages and see if there is a noticeable different in growth rates if they are say in their 2nd instar and separate vs 3rd etc. With and without the adults. Would be a VERY time consuming process.. but interesting to know.